Yesterday, Sherrie Petersen at Write About Now reminded me about a critical element of the antagonist–they don’t change. I know…but sometimes I forget. This was actually part of Sherrie’s post on making sure that every character except the antagonist has a story arc, at the end of which they do change. But, yeah, not the antagonist. I’ve been working these last few days, to try and get closer to my antagonist, to turn her into a real person who does real things to impact/hurt my hero. I’ve been doing research about the type of person I know her to be, and I’ve been checking into my craft books on techniques for creating this character role in a story. Just because the antagonist doesn’t change, this does not mean they don’t have a goal. They do. It’s got to be, in basics, the same goal as the hero–hence the big conflict as they each try to go after it. I’m pretty sure it’s James Scott Bell (in Plot & Structure) that your antagonist had better be as strong, preferably stronger than, your hero. Otherwise, your hero, even if/when they win the battle, doesn’t come off looking all that powerful. Cuz, you know, maybe even a toy poodle could beat that wimpy antagonist. The antagonist’s meanness or selfishness or paranoia or destructiveness has to translate into action. Just as each scene has to have your hero doing specific things to get to their goal, the antagonist has to do specific things to stop them, or to get to the goal themselves. Keyword here: specific. 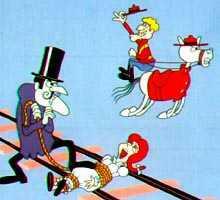 Snidley Whiplash doesn’t just sneer and bluster–he actually ties Penelope Pitstop to the railroad tracks. Okay, yes, over and over and over, but you get the point. The antagonist has to have just as much (more?) at stake, in terms of not reaching their goal, as does the hero. Why does it matter so much to the bad guy to get the treasure, to keep the hero away from it? What will happen to the antagonist if they don’t win? And whatever something is, it had better be really, really bad. Symbolic or not, we’re talking life & death here–for both sides. Layers. The antagonist has to have layers, just like the hero. Unless, you know, you’re purposely writing about Snidley and Penelope. The more you can make your reader understand the bad guy, the more tension you’re going to create on the page–because it’s not just all rooting for the good guy at this point. Wouldn’t it be great, you’ve got your reader thinking, if everybody could be happy? And they get all stressed out while they read, because they know that’s impossible. Tense, stressed reader? That’s a good thing! You need to know what your antagonist is doing behind the scenes. Not just what they’re plotting and scheming, not just the traps they’re setting up for your hero that will cause great pain and strife, but their day-to-day life. What do they do when they’re not thinking directly about how to mess with the good guy? Because out of that daily routine will come the other stuff–if you know that, every morning, your antagonist has to drive across the Golden Gate bridge, well…suddenly you can start thinking about a really good car chase, with those orange (no, they’re not really gold!) pillars coming out of the fog, one by one, as the drivers barrel through all the traffic. You need to do the work. This is what I’m telling myself right now, after writing a first draft in which the antagonist is pretty much a limp, whiny noodle of a character. That it’s time to do the work, to figure out who this person is and what she does. Because, honestly, I can’t stand to write another draft without her being there, without her pushing buttons and creating problems–doing stuff. What about you? How well do you know your bad guy? Got any tricks to share, for turning a vague sense of blech into a living, breathing character? Drop those thoughts into the comments! Oh man, Becky! Creating my antagonist has been strange. He’s a pretty bad guy, but I’ve tried to make him multi-dimensional. I thought he, too, was supposed to have a character arc. Of course, he doesn’t have one yet because I’m not particularly good at making those. Anyway, this whole post struck a chord as something I really need to digest, so thanks! Claudine, I think they have some kind of arc, in terms of trying for their goal and things getting worse, but I think they fail because, in the big sense, they CAN’T change. Happy writing! Great post, Becky. I’m going to file it where I might look back on it after I’m done my first draft and trying to figure out the layers that I need to add. As to my antagonist? SHe’s my character’s grandmother and everyone who has read the chapters in which she appears said that they don’t like her and that she comes across really clearly. I can’t say that I know what I’m doing…except modeling her after someone who often gets under my skin! Hopefully I’ll discover more about her as I write and layer. Thanks, Carol. Good for you–it sounds like you are getting her on the page, which is hard! Love the graphic! Dudley DoRight will save Penelope! Have fun creating a three dimensional antagonist for your story. I write some scenes from the antagonist’s point of view. Really helps me understand him/her. Jenn, that’s in my plan. Do you write the scenes you think you’re going to USE, or some other scenes that probably won’t go into the story, even from the other pov, just to get to know the antag? Frex, in The Secret Year, I wrote some of the confrontations between Austin and Colt, and Michael and Colt, from Austin’s and Michael’s POVs, respectively. But I also wrote some scenes from Austin’s POV that aren’t in the book: how he found out about Julia’s death, what happened on his first date post-Julia, what he thought about the poems in Quill, etc.